This .999 fine silver coin is made by the Casa de Moneda de México (established in 1535), the oldest mint in the Americas. The obverse surface of the coin bears the current coat of arms of Mexico surrounded by the historical coats of arms. The backdrop of the reverse surface features a landscape with the volcanoes Popocatépetl and Iztaccihuatl. The winged figure of El Ángel de la Independencia (The Angel of Independence) that adorns the foreground is a reproduction of the one that stands atop a victory column commemorating Mexico’s War of Independence. Thus bearing several of its most important national symbols, the Libertad coin is a celebration of the proud heritage and history of Mexico. You can take discreet direct delivery or choose to store your 1 oz Silver Mexican Libertad Coin safely and securely with Kitco Allocated Storage. 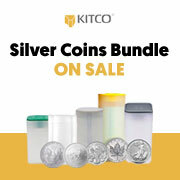 Kitco offers global options for silver bullion coin storage that are fully segregated, insured and allocated. Kitco's network of top-tier silver vaults include some of the most secure silver storage facilities located in Canada, Hong Kong or the United States (COMEX approved). Cayman Islands silver storage is also available (certain conditions apply). Why buy Mexican Silver Libertad Coins from Kitco? Kitco is a trusted leader in the precious metals industry. Silver bullion coins and other precious metals sold by Kitco are recognized in bullion markets around the world. With our focus on silver bullion coins, you benefit from pricing and premiums that are highly competitive in the industry. At Kitco, we make it easy for you to manage your tangible wealth. The Silver Libertad Coin(s) you receive may not be in absolute mint condition. The Mexican Silver Libertad Coin(s) you receive may be from a different year's mintage and the appearance may be slightly different from the 1 oz Silver Libertad Coins illustrated here.